Lots of dogs love to play with plastic water and soda bottles, but it's nearly impossible to use these to play interactively with your dog – until now! The Bottle Rapper is simple. Each end opens up so that you can easily insert a 16 oz. plastic bottle. Pull the handles so the ends cinch up and it holds the bottle inside. Hey! You have a two handled tug toy! Your dog will still hear the exciting crackle of the plastic bottle, but won’t be able to chew it up or swallow small pieces. 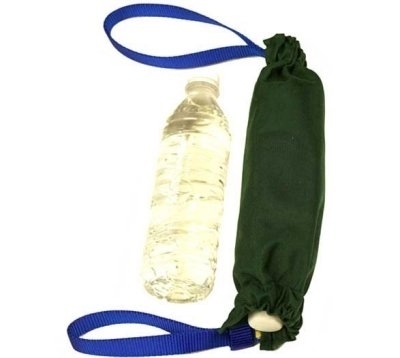 Although we originally designed the toy to hold a bottle, you can use it for almost anything that you want to get the dog interested in tugging with or that you want to protect from your dog's teeth. We've stuffed our Bottle Rappers with plush toys, rabbit skin, noise toys, and so on. Nylon handles are 6.5" long and the 1000 denier Cordura 4.5" x 9.5".